The City of Toronto has completed a study to determine the preferred location and design for a new east-west street between Rean Drive and Kenaston Gardens located southeast of the Bayview Avenue and Sheppard Avenue East intersection. The purpose of the Environmental Assessment (EA) was to evaluate alternatives to enhance the existing street between Barberry Place and Rean Drive with a new extension between Barberry Place and Kenaston Gardens. The study focused on supporting planning objectives for the area, improving access for pedestrians to the Bayview Subway Station and neighbourhood connectivity for all road users. A Project File (final report) has been completed and placed on the public record for a 30-day review period starting Thursday November 16, 2017 and ending on Friday December 15, 2017. See the News & Updates section below for more information. The City has completed a Municipal Class Environmental Assessment (EA) study to determine the preferred location and design for a new east-west street between Rean Drive and Kenaston Gardens located southeast of the Bayview Avenue and Sheppard Avenue East intersection. This new street will provide improved pedestrian connectivity to nearby transit services, as envisioned in the Sheppard East Subway Corridor Secondary Plan and the Southeast Bayview Node Context Plan. The City intends to proceed with detailed design and construction of the project, subject to comments received as a result of this study and available funding. The area around Sheppard Avenue East and Bayview Avenue in the North York District is a community experiencing significant residential development. There are a number of plans already in place which guide development with specific recommendations for transportation options which this study will consider. First adopted by the City of North York in 1996 and subsequently included in the Toronto Official Plan in 2007 provides an overall strategy to manage, direct and ensure quality development as well as to encourage long term development in key nodes (connection points) along the Sheppard subway corridor. The Secondary Plan identifies the area surrounding the intersection of Bayview Avenue and Sheppard Avenue East as one of these key nodes with the TTC’s subway station at its centre. The Southeast Bayview Node Context Plan was adopted by City Council in 2000 to support the implementation of the Secondary Plan goal and objectives for this area and provide a framework for development. The context plan identifies a number of transportation improvements including a new east-west street connection between rean Drive and Kenaston Gardens. Since the Context Plan was adopted by Council, a portion of the new street between Rean Drive and Barberry Place has already been constructed but has not yet been dedicated as a public street. In addition to evaluating a new street extension between Barberry Place and Kenaston Gardens, this study will also review and determine whether the portion between Rean Drive and Barberry Place meets current City standards and can remain as is and be assumed by City or if further design and construction is required. This study is being carried out as a Schedule B of the Municipal Class Environmental Assessment which is an approved planning process under the Environmental Assessment Act. The City has completed the New Street between Rean Drive and Kenaston Gardens study report and issued it for a 30-day public review period from November 16 to December 15, 2017. The City of Toronto has conducted a Municipal Class Environmental Assessment Study (the “EA Study”) for a new east-west street between Kenaston Gardens and Rean Drive under the Schedule “B” process. The recommendations of this EA Study implement the policies and planning objectives outlined in the City’s Official Plan, the Sheppard East Subway Corridor Secondary Plan and the Southeast Bayview Node Context Plan. The recommendations of this EA Study also address the Official Plan policies related to the need to develop a more pedestrian and cycling-friendly environment aligned with the Accessibility for Ontarians with Disabilities Act (AODA). This study, which was undertaken by City of Toronto, initiated undertaking background studies of the area in May of 2016, with the formal Notice of Commencement being issued in September of 2016. In accordance with the Municipal Class Environmental Assessment Planning Process, the study followed a process of developing and evaluating alternative solutions and recommending a preferred solution. Under the Southeast Bayview Node Context Plan, a new east-west street between Kenaston Gardens and Rean Drive is envisioned to provide improved pedestrian connections, smaller block sizes, and further frontage for street-oriented buildings. The new street will also serve and be accessible to users of all ages. A portion of this new street has already been constructed through development. There may be potential to coordinate timing for construction of the new street with development. 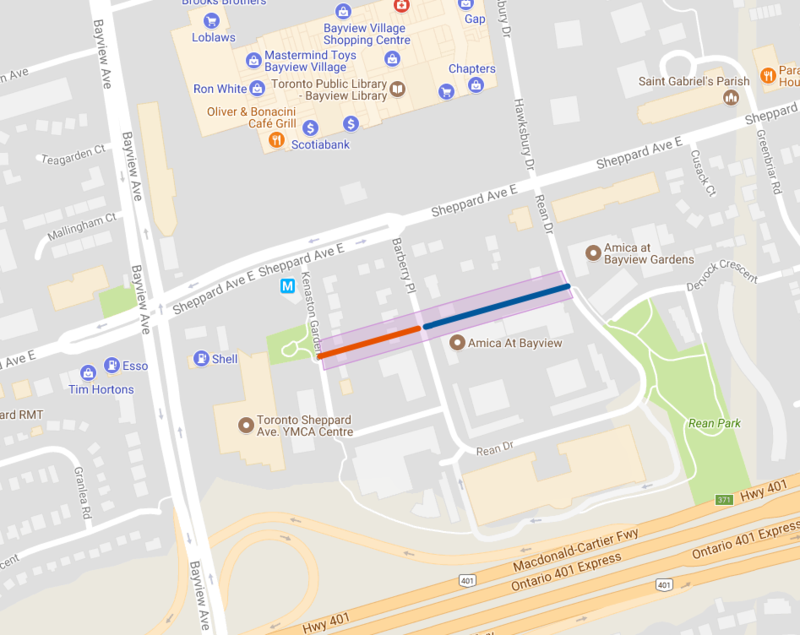 The existing private driveway between Barberry Place and Rean Drive will be updated to meet City of Toronto standards for elements such as roadway and sidewalk widths, street lighting, etc. Do Nothing. This alternative would maintain the existing private driveway between Rean Drive and Barberry Place. In this case since the driveway does not meet City standards, the City could not assume the driveway and take over its operation and it would remain private. New east-west street (Kenaston Gardens to Barberry Place). The new portion of street would be built to City standards. Approximately the west half of this street (Station 0+000 to 0+068 as shown on Figure 7.5 and in detail in Appendix E) is planned to be built by the adjacent Chestnut Hill development and turned over to the City. The existing driveway between Rean Drive and Barberry Place would remain as-is. Reconstruct existing street (Barberry Place to Rean Drive). In this case the City would rebuild the existing driveway to City standards and could assume this street, but the portion from Barberry Place to Kenaston Gardens remain as-is. Combination of New and Reconstructed Street (Alternative 2 and Alternative 3). With this alternative the City would rebuild the east portion and build the remaining unbuilt and full west portion to City standards and the City would assume the roadway to operate it as a City street. (Alternative 2 and Alternative 3). Consultation with technical agencies and stakeholders helped identify Alternative 4 as the “Preliminary Preferred Solution”. Alternative 4 was then confirmed as the Preferred Solution based on input at the Public Information Centre and subsequent input and review. The Refined Preferred Solution (Figure 7.1 to Figure 7.5) is for new and reconstructed street by providing a new street between Kenaston Gardens and Barberry place and reconstructing and improving to standards the existing private driveway between Barberry place and Rean Drive. New 2-lane east-west street between Kenaston Gardens and Barberry Place. Reconstructing the existing east-west street between Barberry Place and Rean Drive to a 2-lane urban cross-section. Providing 2-way stop signs at the intersections of Kenaston Gardens, Barberry Place and Rean Drive. Providing continuous sidewalks on both sides of the new east-west street to enhance the pedestrian environment and thereby improve accessibility within the immediate study area. Opportunity for new tree plantings, street furniture and street lighting. Providing a storm sewer system to provide quantity and quality control to stormwater runoff. Throughout the study, the public and various interest groups have had opportunities to make comments, identify issues and provide additional information. Opportunities to provide feedback included one public information centre, five stakeholder meetings, three Technical Advisory Committee meetings, and correspondence with several agencies. The comments provided by the public and interest groups have broadened the information base for the project and facilitated decision making in the process. Anticipated impacts include traffic impacts at the intersections including pedestrian access at sidewalks of the New Street on Rean Drive, Barberry Place and Kenaston Gardens. The construction will need to be coordinated with the Liberty Development access and the building frontages with their main access, sidewalks. Mitigation is limited mainly to coordination of the design, features and grading with adjacent properties. The design must avoid impact to the heritage property at #9 Barberry Place. The total estimated cost is $631,242, exclusive of costs associated with property acquisition requirements. The estimate is based on the recommended pavement structure of 40mm HL3, 60mm HL8, 150mm Granular A and 250 mm Granular B. The estimate also includes the anticipated storm water infrastructure, demolition of the existing homes and relocation of utilities. Since most of the proposed right-of-way requires the acquisition of private property, the City will need to work closely with property owners to acquire the necessary property. In total, the City will need to acquire property and/or acquire permanent easements from 2 landowners. To request assistance with any difficulties viewing these documents, call Maogosha Pyjor at 416-338-2850 or email.